While the latest trend of stirring butter into coffee may not appeal to you at first, the inventor of ‘bulletproof coffee’, Dave Asprey, claims there are a myriad of reasons to drink his creation. Although coffee alone possesses a number of scientifically backed benefits, adding butter is said to lend a creamy texture and some important nutrients to your morning brew. In fact, despite the recent publicity, the practice of adding butter and other fats to coffee for its health benefits is not a new one! This drink has been enjoyed for centuries by people from the Himalayas, Ethiopia, Nepal, Vietnam, and Singapore, while yak-butter tea drinks are consumed in Tibet by mountain trekking locals. Want to know more about the benefits – and pitfalls – of adding butter to your coffee? Keep reading. Using butter in your coffee gives an almost creamy, latte-like texture, meaning you can skip the whipped cream and two spoons of sugar you normally use to get the same effect. And if you’re making these creamy concoctions at home instead of grabbing a Starbucks’ Grande Caffe Latte, you’ll be saving yourself over 17 grams of sugar (not too far off the maximum of 25 grams per day recommended for women)! Too much sugar can lead to some serious health problems – like obesity, tooth decay, fatty liver disease, diabetes and more. Omega 3 fatty acids are essential for normal growth and play an important role in the prevention and treatment of coronary artery disease, arthritis, inflammation, cancer and high blood pressure. These fats are vital for our health, yet our bodies cannot produce them – meaning we must obtain them from our diet. What’s more, for optimal health it’s imperative that we balance our intake of omega 3 fats with our intake of another essential fatty acid – omega 6. Yet the standard American diet is far too high in omega 6 fats, leading to an unhealthy ratio. Known as ‘the forgotten vitamin’ as it is so often overlooked, Vitamin K helps in blood clotting and keeping the bones strong into old age. Vitamin K is found in leafy green vegetables, natto – a type of fermented soy bean, blueberries and grass-fed animal products, such as butter. Conjugated linoleic acid (CLA) has long been touted as a ‘miracle’ weight loss aid. In a 2004 study, a group of overweight women lost 9% body fat in just one year thanks to CLA supplementation – without making any changes to their dietary or lifestyle habits. Not only does CLA burn belly fat, but it protects against cancer and encourages muscle growth. Naturally, drinking black coffee alone won’t keep you full. However, when you add butter to your coffee, you’ll be increasing its caloric and fat value – stopping hunger pangs kicking in. In fact, fats are an important component of a healthy breakfast as they provide the most concentrated source of energy and prolong emptying of the stomach after eating. Many fans of bulletproof coffee swear it gets them through to lunch without any re-fueling (although many others say this is not the case and a mid-morning snack is required). Many people suffer the jitters after a cup of coffee – particularly that first cup on an empty stomach. Others can feel queasy and unsettled as the coffee is simply too acidic for them to handle first thing in the morning. Adding butter to your brew can reduce these effects as the fat content lines the stomach, protecting you from shakes and nausea. However, if you’re really sensitive to coffee perhaps it’s best you stick to tea. While tea still contains caffeine, it affects the body differently as it also contains theobromines and l-theanine – compounds that counter some of the stimulant properties of caffeine. 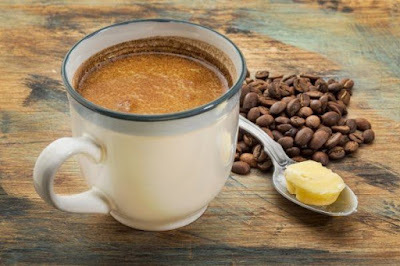 A coffee made with two tablespoons of butter as suggested contains 200 calories, no carbohydrates and 22 grams of fat – 14 grams of which is saturated. That’s just over the 13 grams recommended by the American Heart Association for those on a 2,000 calorie a day diet! And as the day wears on, the amount of saturated fat consumed is likely to jump even higher. Due to these high levels of saturated fat, there have been numerous reports of people having massive increases in cholesterol levels when drinking bulletproof coffee. High cholesterol can double the risk of heart disease so it’s not something to be taken lightly. This high calorie, high fat drink – recommended as a breakfast replacement – is devoid of fiber and carbohydrates and is incredibly low in protein… nutrients which are vital for a well-rounded diet. By consuming this as your breakfast, you’re not only missing out on these macronutrients but also on fruits, vegetables, vitamins and minerals…essentially reducing the total nutrient load of your diet by a third. Is Butter Coffee Right For You? This coffee can work for some people – just look at Dave Asprey, the creator – but it may not work for everyone. For example, in addition to those with heart conditions, those with a sedentary lifestyle or office job may want to think twice before replacing breakfast with this brew. After all, it is so popular with Tibetan mountain trekkers as it can sustain them on long and strenuous journeys. As dietitian Dr. Sarah Schenker says ‘you can’t just transfer the drink to our more static Western environment and expect it to aid weight loss’. Instead, think of this drink as an occasional treat – the key to reaping butter’s benefits is to use it in moderation. It’s also recommended you keep an eye on your blood fat levels if you want to drink this regularly. This drink is pretty easy to make – simply blend fresh coffee with butter and enjoy. Of course, you’ll want to choose the best quality butter you can find. It should be marked as grass-fed (not grain fed) as this provides the most omega 3 fatty acids and vitamin K and is the butter that has been linked with lower rates of heart disease. Using an organic and unsalted butter is also important. Novice bulletproof coffee drinkers will want to start off slowly. The first time you make this drink just use a teaspoon or two of butter, gradually working up. This allows time for your body and palate to adjust. The key to achieving a latte-like consistency is to emulsify the fat with the coffee. This can be achieved by using an immersion or regular blender to thoroughly mix the drink until it’s frothy. Replacing some of the butter with coconut oil can also help in this respect, and will provide a little dose of lauric acid.